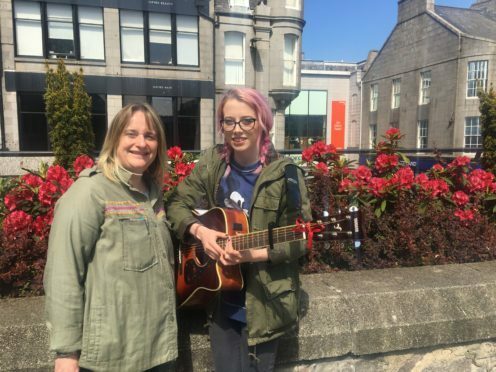 A teenage musician livened up lunch time in Aberdeen city centre yesterday by performing acoustic versions of pop hits on a rooftop. Emily Watt, 19, entertained businessmen, skateboarders and office workers alike as she played guitar at the bandstand atop the St Nicholas Centre. The performance was arranged by Aberdeen Inspired as part of a series of musical showcases designed to encourage more people to visit the spot, which was refurbished in 2015. During the next month, more talented youngsters will parade their skills there every Thursday between 12.45pm and 1.15pm. Miss Watt, a music student at the North East Scotland College, regularly takes part in open mic nights at the city’s pubs and offers children with additional needs music tuition. She said: “I do a lot of covers, but I completely change the songs and have recently started writing my own songs. Miss Watt’s set included acoustic takes on tunes by artists as diverse as Radiohead, Britney Spears and Ed Sheeran. She concluded the concert with a rousing version of Feeling Good, which was made famous by Nina Simone. Project manager with Aberdeen Inspired, Angela Joss, was among the onlookers applauding Miss Watt’s efforts. She said: “This will be going on throughout June, as we want to make sure people use this space. Other students interested in arranging a slot at the rooftop garden should consult college staff.